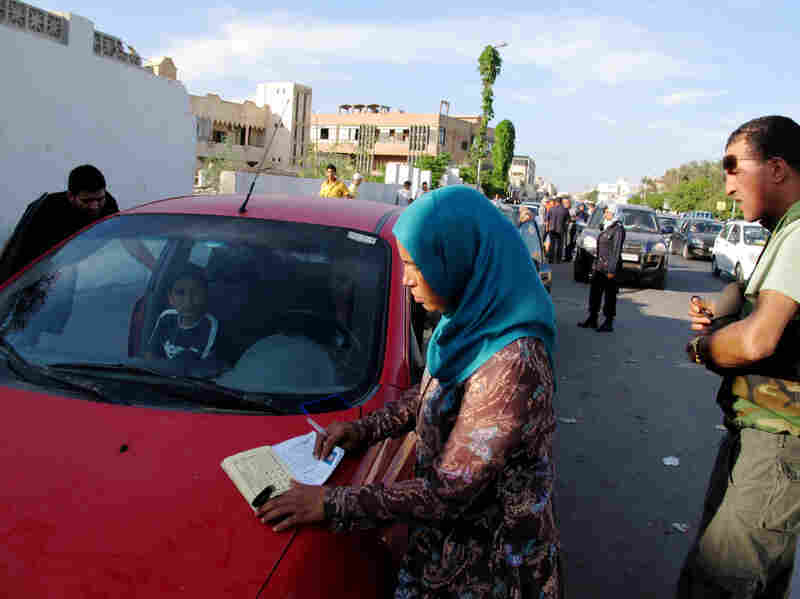 When It Comes To Gasoline, It Pays To Be A Woman In Libya Cars stretch as far as the eye can see outside Libyan gas stations because of a shortage caused by the global campaign against leader Moammar Gadhafi. But the government has set aside a gas station in Tripoli for women only — meaning the ladies can avoid the lines of scuffling male drivers. 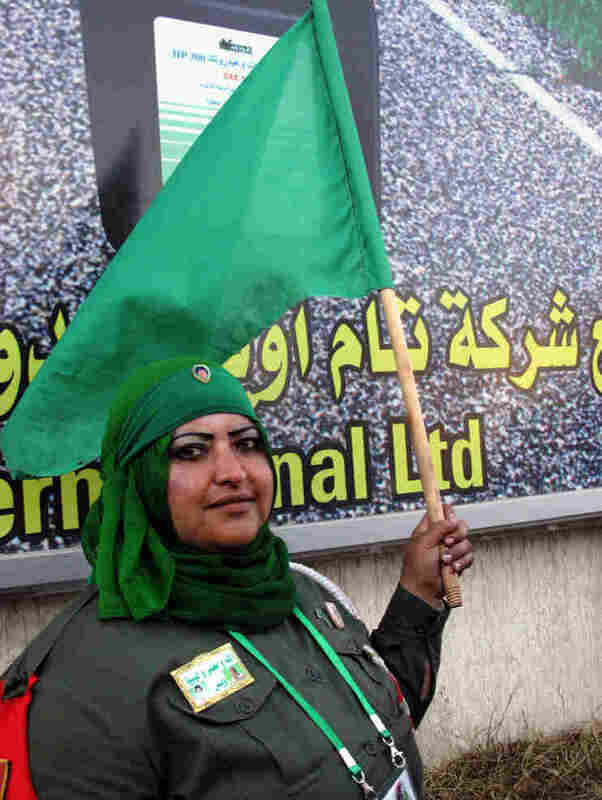 Volunteer Ibtisam Saadeddin, who wears a khaki uniform and a badge and pins with photos of Moammar Gadhafi, says she patrols the line at the women-only gas station to make sure no fights break out. For Libyans, one of the main hardships caused by the worldwide campaign against their leader, Moammar Gadhafi, is a nationwide shortage of gasoline. Fighting has nearly ground to a halt the oil-rich nation's ability to refine fuel. A naval blockade keeps any fuel tankers from leaving or reaching the North African nation's ports. The shortage has led to cars lining up as far as the eye can see outside Libyan gas stations providing what little fuel is left at normal prices. But being a woman there means you may not have to wait as long to fill up. That's because Gadhafi's government has set aside one gas station for women only. It has nothing to do with Libya being Muslim or segregationist when it comes to the sexes like some Arab countries. In fact, Gadhafi is seen by many in Libya as an emancipator of women. He elevated many of them to powerful posts to create allies to help bolster his regime. But Libyan officials say for safety reasons, the government feels it's best for women not to be out all night in gas lines. Even in the daytime, frustrated male drivers can be seen arguing with Libyan authorities and scuffling among themselves while they wait for their turn at the pump. Unlike regular gas stations, the queue to get into the women's station in the Gurji neighborhood of Tripoli is only a few blocks long and orderly. Attendants quickly fill up the tanks of the cars that are for the most part pushed into the station. The manager at this station is a 36-year-old volunteer named Mabarka Mohammed al Mansouri. "Women can't stand in the men's line because they are very, very long," she says. "She has things to do at home, like caring for her children." Volunteer Mabarka Mohammed al Mansouri, who manages the women-only gas station in Tripoli, checks the identification of one of the gas line patrons to make sure they haven't pumped gas in a week. The other women-only station has since closed because of the growing fuel shortage. Mansouri adds that it has gotten so bad that since last week, women who come here are permitted to fill up their tanks only once a week. Still, customers like Samira Ahmed like having a station just for them that is open from 9 a.m. to midnight. She says it cut down her waiting time from one week to 24 hours. Not that she waits here all night; she and other female drivers line up, then lock up their cars and return the next morning. She says she's mad at NATO for making life so hard for Libyans. "This never was the case before, our having to get fuel this way," Ahmed adds. Najia Majdoub says she hasn't visited her relatives in months because she's afraid to use her car for anything other than getting to the mosque where she works as a teacher. It's clear that for Gadhafi's army, running out of fuel would pose a far bigger problem than NATO's sporadic air campaign. At a Sunday news conference, spokesman Moussa Ibrahim deflected questions about how much fuel his government has left. "But surely as you can see from the queues, it's not enough," he said. "Vital, vital services to the population are not being performed because of the fuel shortage." He urged journalists to report on the hardship the NATO campaign is posing, rather than recent rebel assaults around a town west of here that is home to Gadhafi's last working oil refinery.